Why Duke University Won't Honor Freshman Roommate Requests This Fall Duke University has decided to stop honoring roommate requests made by incoming freshmen — returning the procedure largely to chance. Vice President for Student Affairs Larry Moneta tells NPR why. 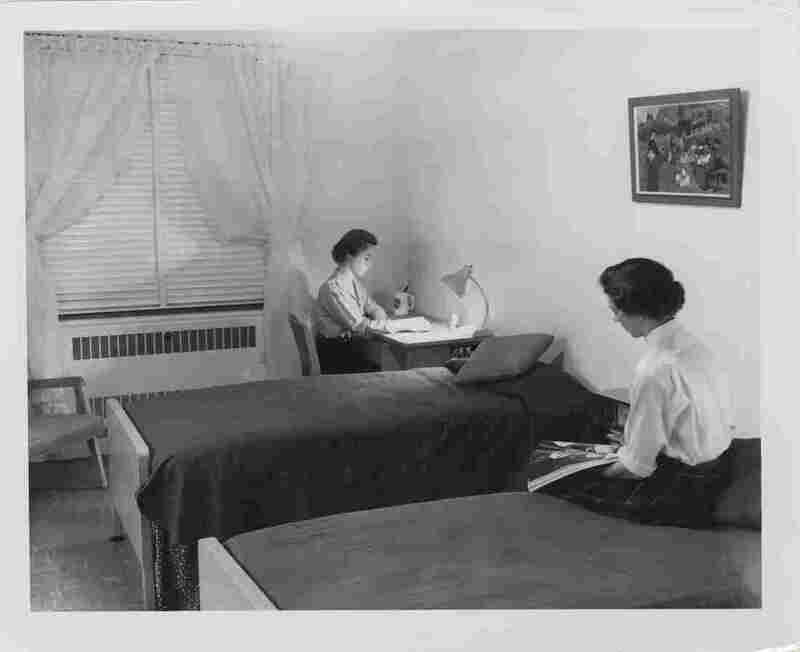 Two roommates in the 1950s study in their Duke University dormitory. The school has decided to bring back largely random roommate pairings. "We believe that you'll enjoy the opportunity to meet someone you've not previously known and will have a great opportunity to explore your roommate's history, culture and interests," read the university's announcement of the change from Larry Moneta, vice president for student affairs, and Steve Nowicki, dean and vice provost for undergraduate education. The university will stop honoring roommate requests and instead match roommates based on lifestyle habits, such as sleep schedules. Moneta says the decision to switch to was inspired by the "enclaves" of homogeneity he saw at Duke that seemingly stem from increasing numbers of preselected freshman roommates. He talked to NPR's Scott Simon about identity-based dorms, roommate incompatibility and reactions from students and alumni. We've watched over the last several years that an increasing number of students were preselecting roommates, taking advantage of social media or friends from home, and it began to become a much larger percentage of the class than we would've liked. There was more homogeneity among the students who chose their own roommates, and so we just reached the conclusion that it was antithetical to our aims of broadening students' horizons and, after a lot of consultation, made the decision that students would be best off by using some very simple survey about sleeping habits and things like that ... and going back to the random assignment process. We're being very deliberate about the kind of first-year experience that we think would best suit our students — an experience that really is about engaging with difference and opening their eyes to opportunities, and meeting entirely different people than the ones they grew up with or went to high school with. We just thought that [randomly selected roommates] would be a better approach. How Do Colleges And Universities Pair Freshman Roommates? There's not a one-size-fits-all model that works for every school, and it's very possible and certainly within our own procedures where there is a need for a kind of pairing. We can make that happen. This is not to suggest that the only way roommates will [be paired] is by letting the computer do the assignments. What we're dropping is the self-selection by a student of another student. If there's a unique need where we need to accommodate a disabled student, a student of color, the system will permit us to do that and we'll still make sure that no one is in a situation that's incompatible or uncomfortable for them ... Uncomfortable, maybe; but not incompatible. I don't want to put a student of color in a position of having to be the educator of a Caucasian student, I don't want a gay student to feel like their job is to educate students who have not been exposed to gay students. But we would like the experience to be one in which students are going to encounter the full range and spectrum of students that we're admitting. If the previous assignment process ended up in too many enclaves of students who are very similar, that works against the opportunity for students who might be different from them. We'll move them apart. We'll find a way to make it work it out. [It's been] overwhelmingly positive, both on and off campus. We've certainly heard from a handful of the incoming class who thought they were coming into one set of conditions, but I would say that [there's] dramatically higher percentages of existing students, alumni, parents who've all said, "This is a good thing. This is what college is all about."